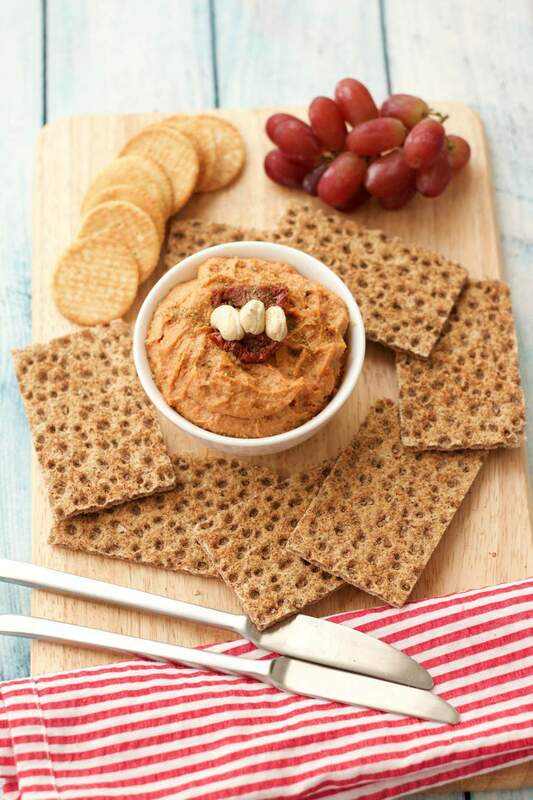 Sundried tomato cashew cheese is absolutely delicious spread on crackers. Or you can dip your raw veggies in it, or put a dollop of it on your salad. Want to have a little cheese and wine set up – vegan style? This’ll do the trick! Here’s the thing about cheese! Most people are crazy about it! 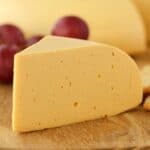 ‘I could never give up cheese’ is often what people say as the reason they could never go vegan. But these days there is just so much good vegan cheese out there that ‘giving it up’ is not required! And then the fact that you can make homemade versions of cheese like cheesy sauces (coming up soon), vegan parmesan and cashew cream cheese (right here right now), really takes the deprivation right out of the equation (which is awesome – no one likes deprivation). 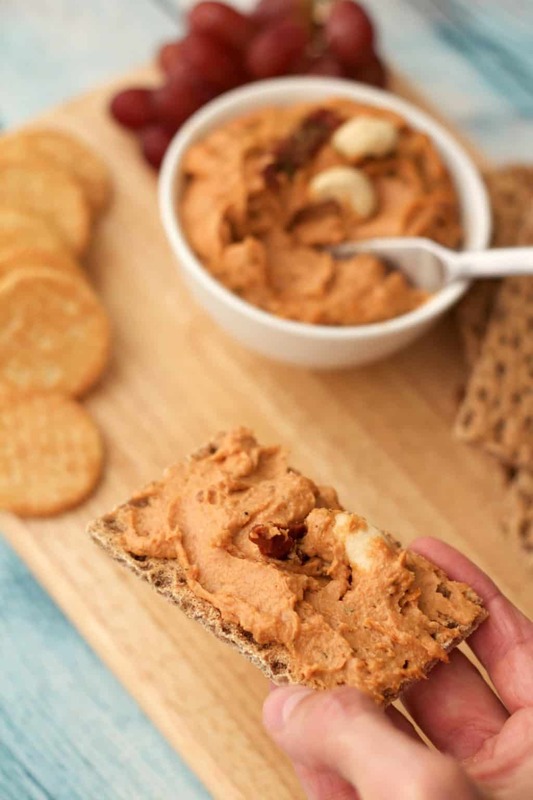 You need a powerful blender to get your cashew cheese to the right consistency, and the Vitamix blender stick (called a tamper) comes in hugely handy when blending up this thick spreadable cheese. If you don’t have a powerful blender like this (with a tamper) then use a food processor instead. A trick to make blending easier is to soak the nuts first. 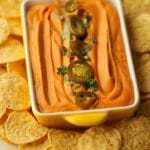 But this only works if you know in advance you’re going to want some nut cheese! We frequently carry on regardless, no pre-soaking, and our Vitamix copes just fine. 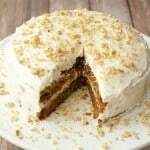 We didn’t soak the nuts first in this recipe! And we have added water to compensate. If you do pre-soak then just know that the water quantity suggested may need adjustment. Start out without it, and add it in only if needed. 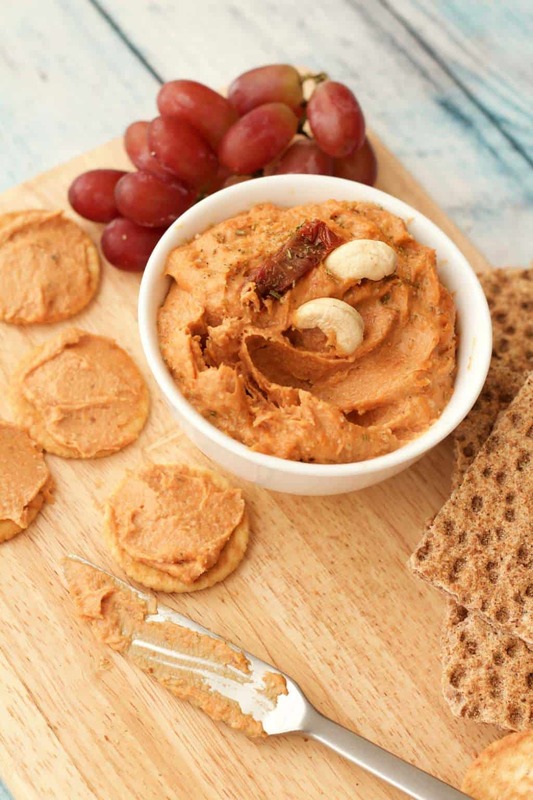 When making cashew cheese a little flexibility is crucial. You might need to stop and start a few times so that you don’t overheat your machine, and add in a little more water or a little less to get the right consistency. It’s easy to course correct though, if it ended up a bit thin, just add more cashews, a bit too thick, add a little more water. The end result is so wow. 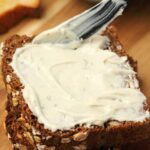 Creamy, salty and smooth, cheesy in all the best ways, like the most creamy cream cheese spread that’s really remarkably close to the cream cheeses I loved in my pre-vegan life. 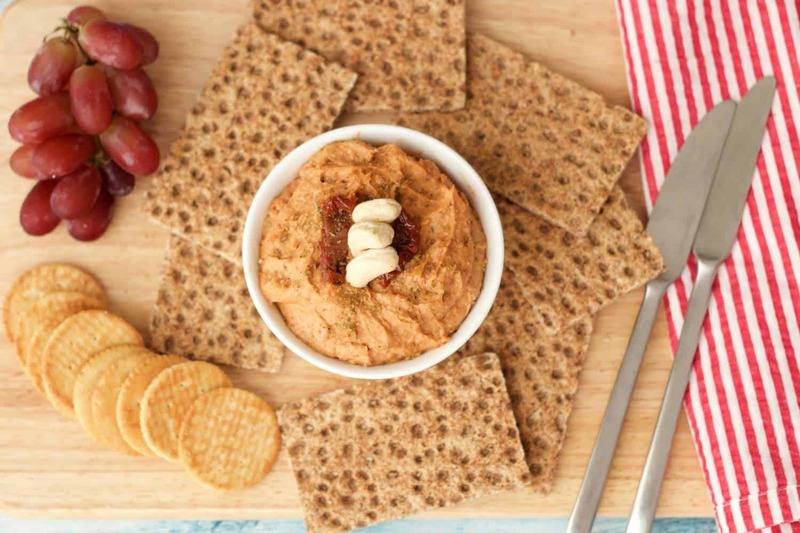 You’ll love spreading it on crackers (raw flax crackers go so well with this), or dipping your raw veggies on it. You can even use it as a sauce for some raw pasta like spiralized zucchini. 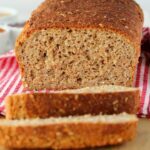 The sundried tomato flavor works so well in this recipe, bringing out the other flavors to perfection! 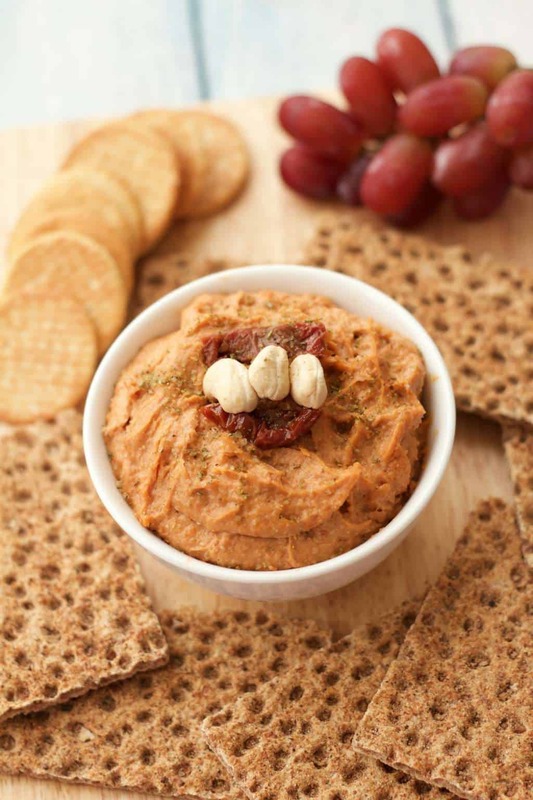 So let us know what you think of this cashew cheese by leaving a comment. We’d love you to rate it as well and let us know how it went when you make it or snap a pic and tag it #lovingitvegan on instagram. We’d love to see it! Cheers! 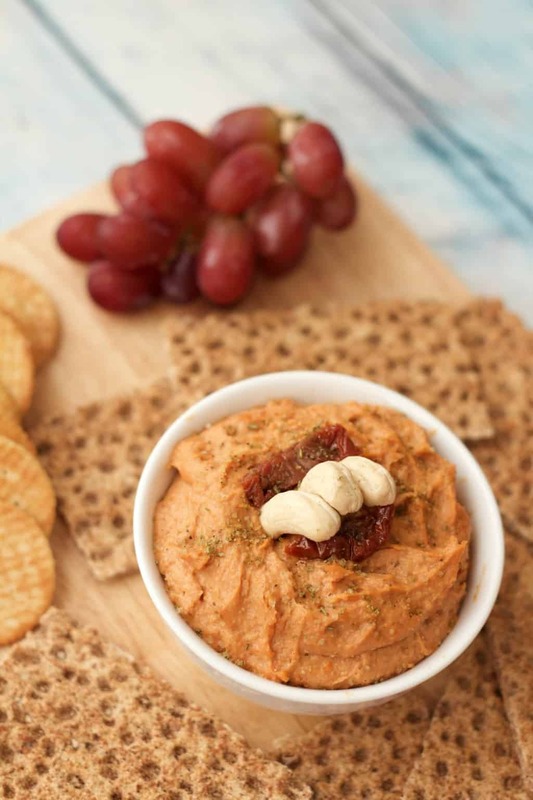 10-minute Sundried Tomato Cashew Cheese. Ideal as a spread or dip. 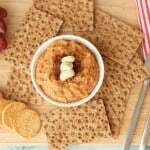 Smooth, spreadable, creamy and deliciously cheesy! Add all the ingredients to the blender (or food processor) and blend until smooth and creamy. This can take a few minutes and it’s best to use a tamper (blender stick) when blending to push it down onto the blades. Alternatively if using a food processor stop every couple of minutes and scrape down the sides and then process again. Use a little more water if required to achieve the proper consistency. 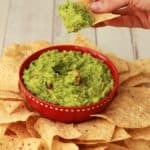 Use as a spread or dip! Store in an airtight jar in the refrigerator where it will keep for a few days (max 5 days). Previous Post: « The Best of 2015 – A Year in Review – The good, the bad and the great! Saw it. Made it! Really good. I had made some dehydrated kale avocado crackers which, I’ll be honest, tasted kind of like lawn clippings but the cashew cheese has saved them totally. Yay! Also, I made it in my sad little old food processor, without soaking the nuts. Just added a bit more water and it was fine. Is this considered raw ? Thank you! 🙂 I bought the stuff today can’t wait to try it! 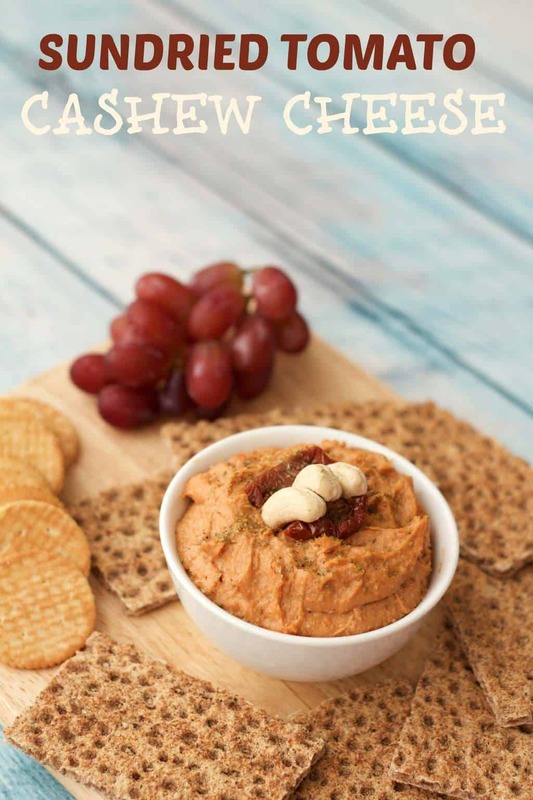 I had almost given up on vegan cheese recipes that I can make out of cashews because it never turned out to be anything that I would really want to eat but this was a very delicious recipe. I would definitely give this a 5-star rating. I had all of the ingredients on hand and it came together very quickly. 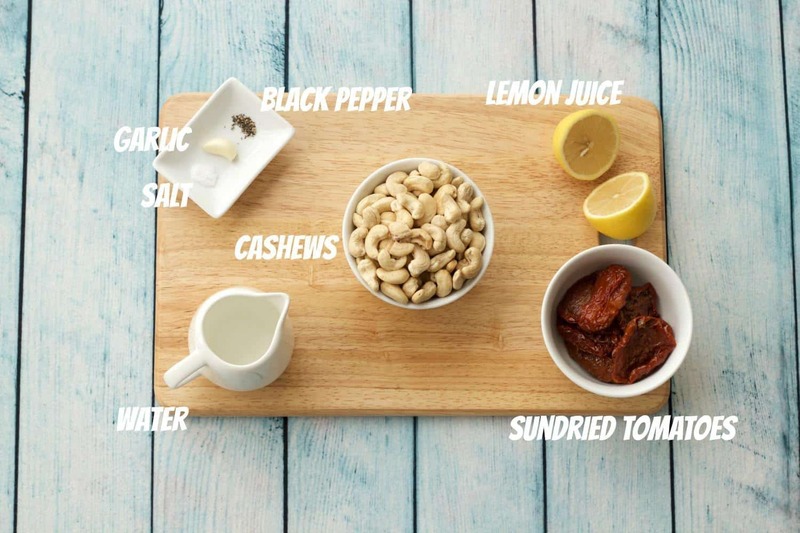 I like the fact that I did not have to soak the cashews. I made the sliceable cheese! What a taste! DELICIOUS ! Awesome! So glad you loved it Bea! 🙂 Thanks for posting! 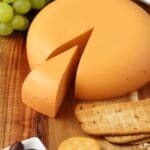 My husband and I loved this cheese recipe! 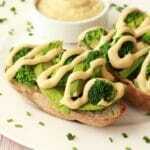 We have moved abroad, and it’s not easy to find nutritional yeast where we currently live. All my previous cashew cheeses were made with yeast. I was trying to find something we like without it. 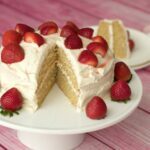 And I was lucky to discover this recipe! Thank you very much for sharing! I add two cloves of garlic and some dry basil.